Hingham Deopham Road postmill had been in the Lane family since at least 1771 and c.1840 John Lane decided to sell it and erect a new towermill at the same location near the south west corner of the pond at Hingham watermill. An etching by Norwich School artist John Chrome from before 1813, suggested that the mill was of an open trestle design. The postmill was bought by millwright, Robert Gilbert, who quite possibly was responsible for building the new towermill for the Lane family. 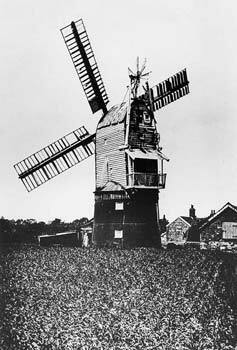 He took the postmill to Banham and erected it on the base of an old towermill, where it became known as Banham composite mill. An exceeding gpood WIND MILL at Hingham in the county of Norfolk, well situated for Business, with a convenient Dwelling House, Stable & other outhouses thereto belongoing, in the Occupation of Mr. Thomas Lane, who will show the Premises. The above Estate is Freehold & moderatley assessed for the Land Tax. For Particulars enquire of Mr. John Howse, Attorney at North Walsham.